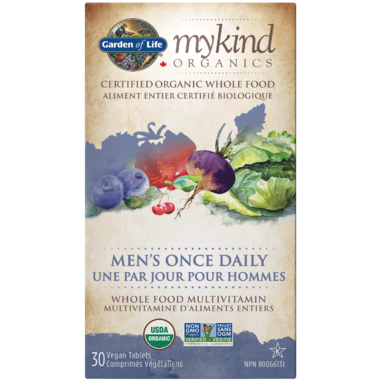 Finally, there’s a whole food multi from real, honest, nutritious foods that’s Certified USDA Organic and is Non-GMO Project Verified and is specifically formulated for the needs of men in a one-daily dose—mykind Organics Men’s Once Daily. 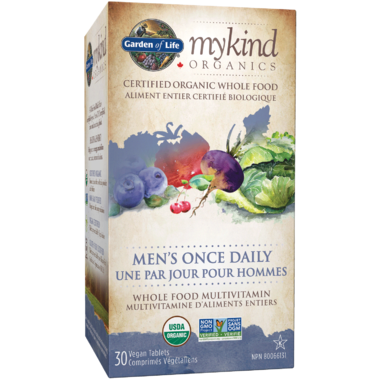 Made from over 30 organic fruits, vegetables and herbs, mykind Organics Men’s Once Daily provides 20 vitamins and minerals with 15 greater than 100% Daily Value, which is excellent for a one-tablet serving. It also provides good levels of B vitamins, including vitamin B-12 in methylcobalamin form—a highly absorbable, active, natural form of B-12, like the B-12 in the body—as well as healthy levels of selenium for prostate health.† Men’s Once Daily also vitamin B-complex for energy and heart health. 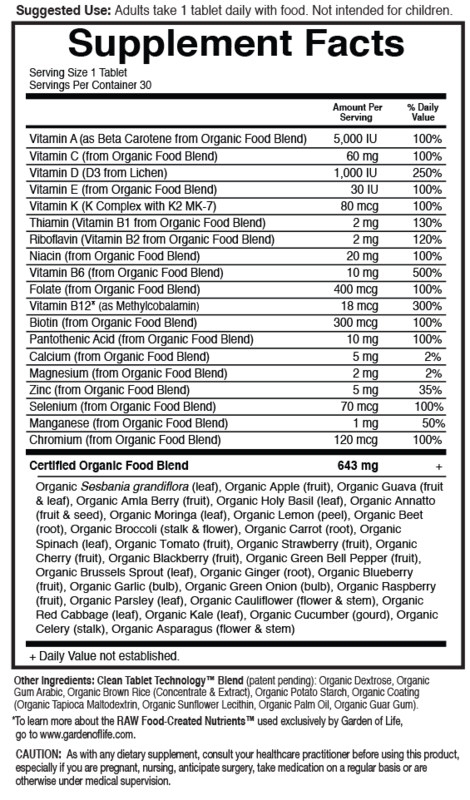 Men’s Once Daily is made from real whole food, including organic fruits, veggies and herbs such as lemons, apples, basil, red cabbage, celery, tomatoes and many other real foods to give men the nutritional “punch” they need in a natural form—and all of them are Certified Vegan, Certified USDA Organic and Non-GMO Project Verified. Directions for Men: Take 1 tablet daily or as recommended by your healthcare practitioner. Take with food a few hours before or after taking other medications. Medicinal Ingredients (per tablet): Beta-carotene†........ 5000 IU/ 3000 mcg, Vitamin C† ......60 mg, Vitamin D3 (Lichen).... 1000 IU/ 25 mcg, Vitamin E†....... 20 mg AT/ 30 IU, Vitamin K1 ......... 75 mcg, Vitamin K2 (MK-7)........ 5 mcg, Thiamine† ....... 1.5 mg, Riboflavin† .........1.7 mg, Niacin†........20 mg, Vitamin B6† ...... 10 mg, Folate† ......... 400 mcg, Vitamin B12* (Methylcobalamin) ....18 mcg, Biotin†......300 mcg, Pantothenic Acid† ....... 10 mg, Zinc†..….5 mg, Selenium† ...... 70 mcg, Manganese† ....... 1 mg, Chromium† ......... 120 mcg. 340 mg, Emblica officinalis Gaertn. (Phyllanthaceae) (50:1) Fruit Extract 50 mg, Psidium guajava (10:1) Fruit Extract 45 mg, Psidium guajava (10:1) Leaf Extract 15 mg, Bixa orellana (10:1) Seed Extract 15 mg, Ocimum sanctum L. (10:1) Leaf Extract 15 mg, Citrus limon (35:1) Peel Extract 10 mg, Moringa oleifera (10:1) Leaf Extract 11 mg, Wrightia tinctoria (10:1) Aerial parts Extract 1 mg, Lantana camara (12:1) Aerial parts Extract 1 mg. *RAW Food-Created NutrientsTM. Non-Medicinal Ingredients: Organic Fruit and Vegetable Blend (Organic Apple, Organic Beet, Organic Carrot, Organic Spinach, Organic Broccoli, Organic Tomato, Organic Kale, Organic Red Cabbage, Organic Parsley, Organic Brussels Sprout, Organic Green Bell Pepper, Organic Cucumber, Organic Celery, Organic Garlic, Organic Ginger, Organic Green Onion, Organic Cauliflower, Organic Asparagus, Organic Strawberry, Organic Cherry, Organic Blackberry, Organic Blueberry, Organic Raspberry), Organic Gum Arabic, Organic Dextrose, Organic Potato Starch, Organic Oryza sativa (Rice) Hull Powder, Organic Rice Bran, Organic Coating (Organic Maltodextrin, Organic Sunflower Lecithin, Organic Palm Oil, Organic Guar Gum).